Some household infestations are common knowledge. House-cats catch mice and leave them as “presents”. Rats can scurry around behind walls. Exterminators for tiny pests like ants and termites are everywhere. They’re getting less unusual as well, with human construction spreading and moving into natural environments. 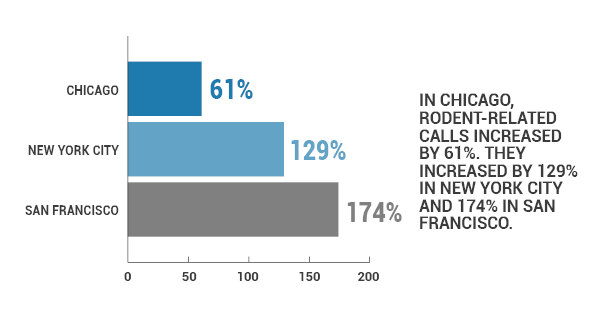 For example, rat-related calls to wildlife control have risen the past few years, including by 61% in Chicago, 129% in New York City, and 174% in San Francisco. But what about squirrels? Those tiny furry tree-dwellers that can be found across the whole of North America? Yes, squirrel infestations are actually becoming more of an issue recently in American homes. While squirrel families typically stick to their outside homes, large populations the past few seasons have meant they’re moving into human spaces. When these cute little guys get into attics, walls, and chimneys, they become very destructive animals. They chew up anything (including fiberglass insulation and wires) and bring the possibility of diseases. They’re arguably cute outside where they belong, not so much inside. Squirrels are bigger than common house mice, and a squirrel family in your attic is difficult to ignore. You’ll hear scratching sounds from them moving through the walls and ceiling, and their spring mating noises are very prominent. You might smell squirrel urine after a while, or worse, the smell of a decomposing deceased squirrel. When they chew through wiring and insulation, leaky roofing and electrical issues can ensue. Blockages in your fireplace can happen if squirrel families decide to nest in the chimney. “Taking care of” a squirrel infestation yourself often leads to more future issues. Trapping an adult or two is a fine first step, but you might be leaving a nest to rot in your home, leading to more unpleasant smells and health risks in a few days or weeks. Your best bet is calling a professional who can humanely take care of the infestation and mark down every bit of damage you should address. If you’ve already had a professional clear an infestation, the professional can likely pinpoint places where the squirrels got into your home in the first place. Openings to crawl spaces, broken attic windows, and chewed openings in roofs are all fairly common. Unlike the kitchen and pantry-roaming mice, squirrels aren’t typically reliant on your food. They mainly enjoy the shelter your home provides. Your best bet to deter squirrels is to close up any big openings around your home that they could enter through. In conclusion, squirrel infestations are the most common issue rodent control experts see, but you’ll notice a higher likelihood of these unwanted rodents around your home for the next couple of years. Take precautions and you likely won’t have to worry about calling in reinforcements to get a nest out of your home.